Have you ever as a business owner wished that you could look into the future to see what your customers would be buying or how they will be behaving? If every company could see into the future, what a great world it would be. Companies would all be profitable, and more importantly, customers would have products that they could only dream of having. This is obviously just a wish, but there is something that can be done to craft the future that your company dreams of… it’s called research. Market research is one of the best ways to have a look into your product through the eyes of your consumer. It allows you a glimpse into how customers perceive your brand and what they wish your brand could do for them. This is the start of seeing the future! Marketing research is based around understanding your consumers’ needs and wants and offering feedback to answer those difficult decisions that you need to make to ensure growth for your business in the future. Here at Qualitative Quarter our aim is to help you make these decisions to ensure your company reaches its full potential. • We have two research venues, based in JHB and PE. • We recruit and host focus groups for clients. 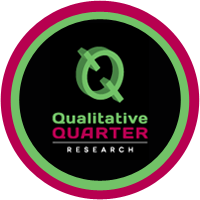 Qualitative Quarter is well known in the qual marketing industry for its focus to detail and expertise. Once we have done your qual, let us take the findings nationally in a quant study for you. We can start small, research doesn’t have to be expensive, and take it forward from there, as we help you grow your business.